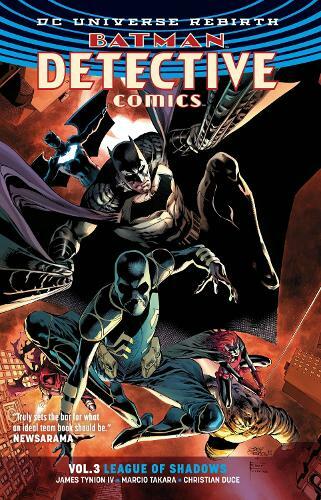 The sweeping new chapter in writer James Tynion IV's acclaimed saga--featuring a league of talented artists including Marcio Takara (THE FLASH) and Christian Duce (BATMAN AND ROBIN ETERNAL)--is here, in BATMAN: DETECTIVE COMICS VOL. 3: LEAGUE OF SHADOWS. Batwoman, an accomplished crime-fighter who's overcome the darkest of betrayals. Clayface, a reformed villain whose potential is eclipsed only by his astonishing powers. New heroes like Azrael, an avenging angel, and Batwing, whose incredible armor makes him a true dark knight. Led by the Batman himself, this team of guardians stands ready to protect Gotham City. But the secrets of the team's most mysterious member, Cassandra Cain, are about to come to light. And that light will cast a shadow darker than anything they've ever seen before. They thought the League of Shadows was just a rumor--a secret society of nihilistic killers often whispered about but never seen. But now the League is here, in Gotham. They're destroying Batman's team one by one. And their sinister leader, Lady Shiva, has come to reclaim her daughter--or destroy her. Can even Batman's arch-enemy Ra's al Ghul and his League of Assassins stop the onslaught? Or have the Shadows come to stay?